We shouldn’t overreact to terrorism, especially not as this terrorism is home-made, thus a reaction to the false politics by the western world. Even though this statement is not to be understood as any kind of justification for terrorism, of course, isn’t it strange that first terrorism is generated, which you have to fight then? What about the politics responsible for it? Shouldn’t that be changed at first? 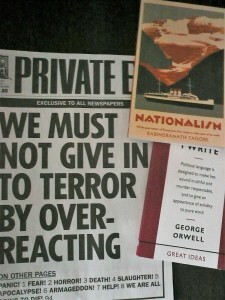 © Collage by Joachim Endemann, using the title page of Private Eye, London, issue: 1 – 14 April, 2016; the cover page of a collection of writings of George Orwell (containing Why I Write, The Lion and the Unicorn, A Hanging, Politics and the English Language) which is the number 20 of the book series Great Ideas of Penguin Books, London, as part of this series first published in 2004; and Rabindranath Tagore, Nationalism, as number 95 of this Penguin books series, this selection of writings of Tagore (Nationalism in Japan, Nationalism in the West, Nationalism in India) was first published in 2010.